Basketball is for the tall, it is said, but there are a couple of players on the Chewelah roster who would definitely disagree with that assessment. Carl Oman and Jaron Baldwin, two of the shortest Cougars on the floor, combined for 43 points last Friday night in a 69-51 come from behind win over Davenport. The visiting Gorillas held a 30-26 lead after a seesaw first half, but Chewelah roared into the lead midway through the third period to notch the northern division victory. Oman scored 16 of his team-high 23 points in the second half to spearhead the Cougar counterattack. Baldwin scored 11 of Chewelah’s 13 first period points and contributed nine more after halftime for a 20-point performance. Also in double-digits for the Cougars were Nick Franks with 12 points and Jake George with another dozen. Baldwin was a metal orb in a pinball machine in the opening period as he zigged and zagged all over both ends of the floor. He turned three steals at one end of the court into lay-ins at the opposite end, drove the lane through the Gorilla towers for two buckets off the glass and made one of two free throws. Nick Franks added a driving layup, and the Cougars had a 13-6 lead with 1:34 remaining in the period. However, Davenport scored the last three baskets to knot the score at 13-all at the buzzer. The second period saw nine led changes as the two teams exchanged salvos. Jake George went over the top of the Gorilla defense for three inside jump-shots to give Chewelah a 19-18 lead near the midpoint of the period. Oman then took over, scoring on an inside jumper, a three-pointer and a put-back to again put the Cougars on top 26-25. But, for the second time, Davenport hit a couple of late shots to grab a 30-26 halftime lead. The quickness of Oman and Baldwin continued to hogtie Davenport defenders after the intermission as the two combined for 25 points in the second half. Baldwin hit a jumper from the elbow and John Larson scooped a layup to even the score at 30 points apiece, and Franks took the ball to the glass for another tied score at 32-32 in the first three minutes of the period. Chewelah grabbed a higher gear and took control of the scoreboard. A trio of three-pointers by Oman, Baldwin and Franks quickly gave the Cougars a 10-point lead at 42-32. An inside jumper from George, a lay-in off a steal by Oman and a stroll through the lane by Baldwin increased the lead to 48-35 with 1:22 remaining. Davenport’s late rally came up short when Oman was floored on a three-point attempt and he went to the line to net all three free throws for a 51-40 Chewelah lead. The Cougars continued to stretch their lead in the final period. Oman drained a three-pointer, George hit a pair of close-in jumpers and Franks made a couple of give-and-go lefty layups off the window. 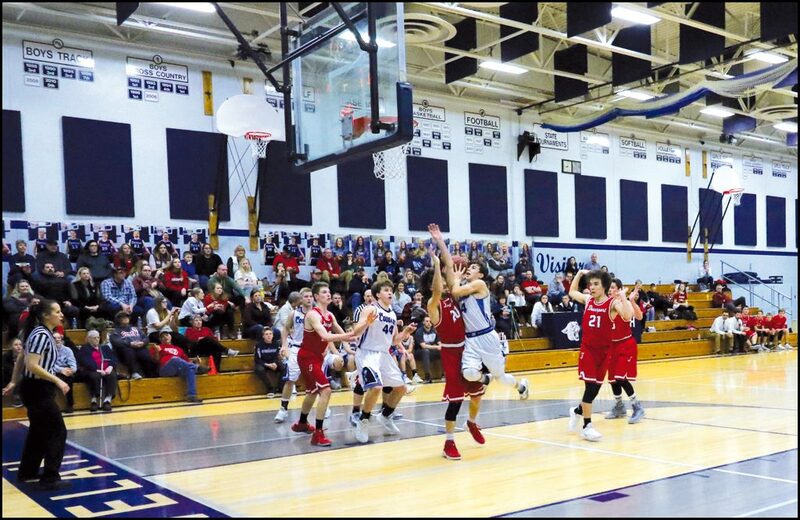 Seven-for-nine free throw shooting by Chewelah near the end of the game secured the 69-51 league victory. The win evened Chewelah’s season record at 8-8. Vince Lombardi’s Green Bay Packers used to say that they never lost a game, but that there were a few instances where time ran out before they could get ahead. The same could have been said by the Cougars at Kettle Falls last Saturday night. They were down by 20 points going into the fourth period but rallied back to cut the Bulldog lead to only seven points at the final buzzer. And, given more time, they probably would have erased the entire deficit. Chewelah trailed 43-24 at the end of the third period. The Cougars had scored only 14 points in the first half, but shots that would not drop through the hoop prior to halftime were now beginning to find their target. Baldwin scored 18 of his game-high 19 points after the break as he led Chewelah’s late rally, aided by six points apiece by George and Franks. Their efforts came up short, however, as time ran out with the Bulldogs leading 53-46. It was evident that Kettle Falls had spent some overtime practices preparing to defend against Chewelah’s weave offense, but the Cougars still launched their share of shots in the opening half. The difference was that Bulldog shots fell through the hole in the hoop with much more frequency, leading to a 26-14 lead by halftime. Chewelah made only three baskets in each of the first two periods. George hit an inside jumper, Franks drained a driving layup off the glass, and Nolan Hansen hit from close range in the first period as Kettle Falls took an early 15-7 lead. Oman finished a fast-break with a lay-up, Hansen put back a rebound, and Franks canned another penetrating lay-up in the second period, but the homestanding Bulldogs grew their lead to 26-14 by halftime. The Cougars made some adjustments during the intermission and returned to the court to outscore the Bulldogs 32-27 through the remainder of the game. They were still behind 43-25 at the conclusion of the third period, but a 22-point surge in the final eight minutes closed the scoring gap to a seven-point spread by the end of the game. The loss dropped the Cougars to a 2-4 record in league play, 8-9 overall for the season. They play two weekend games again this Friday and Saturday. They travel to top-ranked St. George’s (14-2) on Friday and return home to host Wilbur-Creston (5-8) on Saturday. The following Tuesday, Feb. 1, sixth-ranked Northwest Christian (11-5) visits Pein-Lynch Gym.